Being a classically trained guitarist, there is nothing that you would like better than to grab that INSTRUMENT and throw out some sweet hot "Duo in G Op.34" by Ferdinando Carulli action (with an accompanist, of course). However, that is not, in fact, a SPANISH GUITAR. In point of fact, there are a number of things wrong with the description for this room. That instrument is actually a GUITARRÓN MEXICANO, not a SPANISH GUITAR. This group of performers should be called MARIACHI, not a "MARIACHI BAND," as the BAND is redundant. 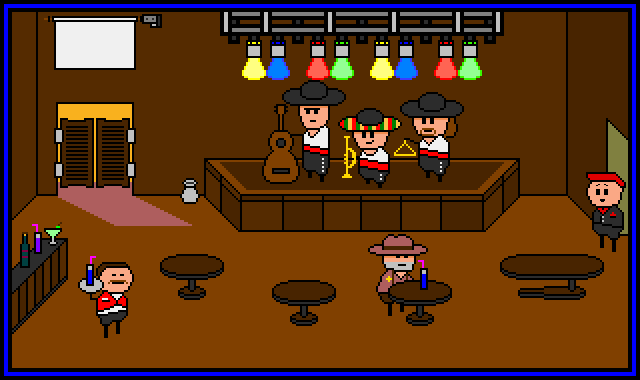 Also, why does the WELL-COIFED MARIACHI have a TRIANGLE? That's not a proper MARIACHI INSTRUMENT. This SOMMELIER should not be called such. On his TRAY is clearly a MIXED DRINK, not simply WINE, as would be a classical SOMMELIER'S sole job to procure, store, and serve. This is not a TABLE that you are standing on. It is the STARSHIP USS ENTABLEPRISE and you are its CAPTAIN. You have no idea why you hopped up here (except perhaps to boldly go where no man had gone before). 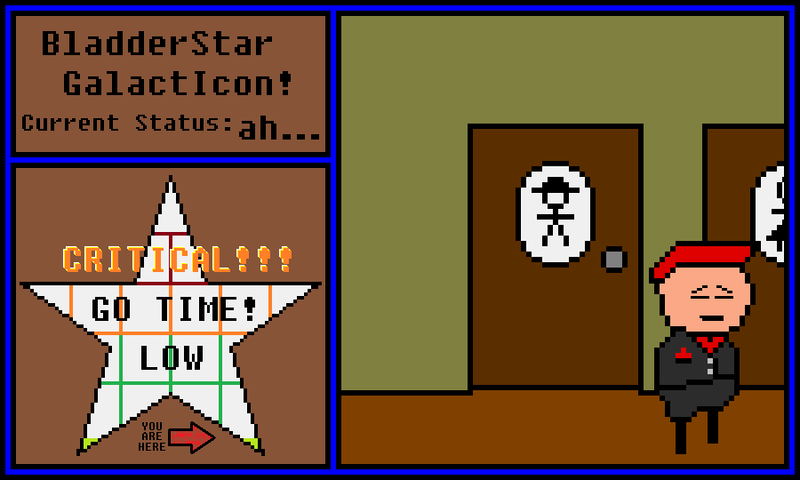 You approach the SHERIFF and begin questioning him about the CURRENT STATE OF WORLD AFFAIRS. SL: Howdy, son. Took yer sweet time in the bathroom, didn't ya? SL: You just came out that door over there, and I've been sittin here for near on twenty minutes and didn't see ya go in. Nothin back there but the restrooms. Ergo, ya'll was in the bathroom for at least that long. Q. E. D.
YOU: So, how's the current state of world affairs? SL: Well, not so good, son. President Rapsknuckle is doing all he can, but he's had to pull back most of his forces into THE CITY. Out here in the WEST, we've been left to deal with the BANDITS, REBELS, CANDAEMONS, and ASSORTED SUNDRY by ourselves. I can only imagine the troubles for folks in the NORTH, EAST, and SOUTH. YOU: OK. Good luck with that. SL: Thankfully, now that you're here, we can finally turn the tables. Yer the new MARSHALL, aren't ya? The one sent weeks ago from THE CITY to take out the BANDIT LEADER? The one who mysteriously never arrived until now and whose bones we thought that we'd found bleaching in tha DESERT? YOU: (Guile attack!) . . . yes? SL: (Success!) Good to know ya, MARSHALL! Glad that you could make it! I'm SHERIFF LEONE. What's yer name? That's a dang fine question! What IS your name? OK. You're up. And you're sure that you're awake this time. That was... weird. Anywho, this SECRET ROOM seems to be a NOT-SO-SECRET WASTE OF TIME. Time to make like a duck and quack. Or... wait. Like a tree and... something? Whatever. You leaf the SECRET ROOM. Oh, the ONE UP VENDING MACHINE came back down, closing off access to the HATCH. Thankfully, you have no time for such distractions! You ignore it and follow the enchanting MUZAK to the WEST. It sounds so DELIGHTFUL! 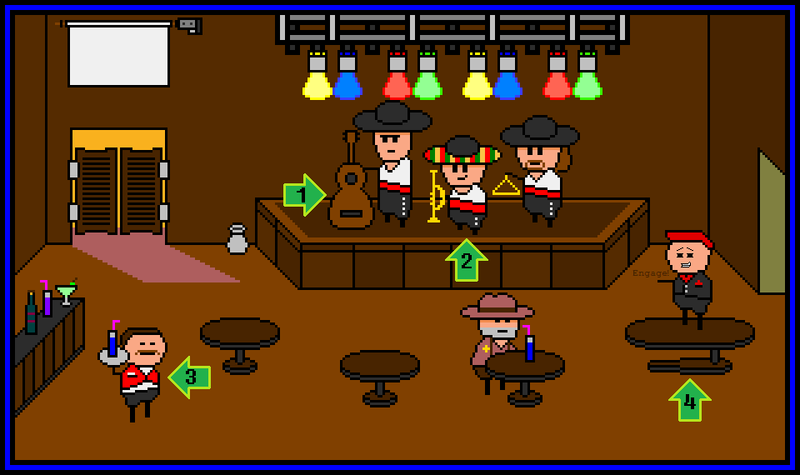 You are now standing in some kind of CANTINA. There are TABLES of various sizes around the room, with a BAR at the other end. A MARIACHI BAND plays some kick-awesome MUSIC on the STAGE, lit by a COMPLEX LIGHTING RIG. 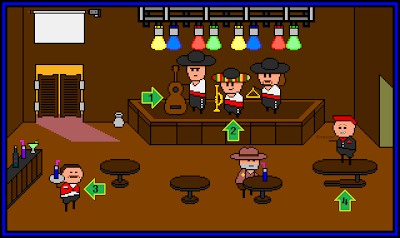 A man with a SHERIFF'S BADGE sips a GIRLY DRINK at one of the TABLES. A SOMMELIER stands by the BAR, ready to serve additional GIRLY DRINKS, like the examples on the BAR itself. By the SWINGING DOORS on the NORTH wall is a SPITTOON. Above the SWINGING DOORS is an REMOTELY CONTROLLED RAISING AND LOWERING BLIND, which is currently in the lowered position. Dang, there is quite a bit to do here. It would be a shame if you were to simply... say... EXIT SWINGING DOORS. A real shame. So you're not going to do that, are you? You don't need to imagine a RED BLANKIE. You can just use your HANDKERCHIEF as a CAPE. Yay. That was quite a MULE TRIP. 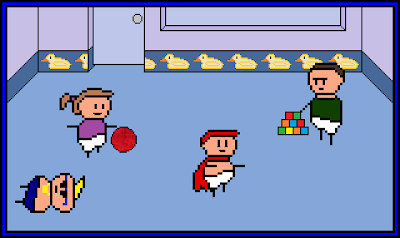 You fly over to the GIRL TODDLER and deferentially ask her if she is in any peril, danger, or other somesuch. GT: ah! ok. ah! use lazah beams! YOU: yah, lazah beams! supahman can make lazah beams! 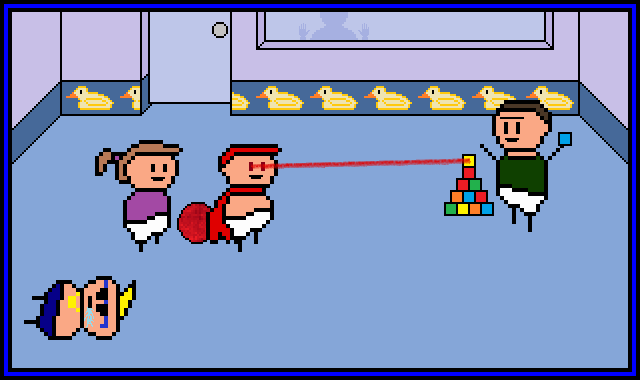 You look at the DUCKIES on the wall. Hehehe! One of these is going into your imagination so that you can giggle about it later! You wrap your RED BLANKIE around your neck in a suffocatingly-dangerous manner. You. Are. SUPAHMAN! Woooooosh! Woooooosh! You dream about a time 170 years ago. You are standing in a well-appointed PLACE that makes you feel WARM and SAFE. There are DUCKIES on the wall, which you like because they are nice animals. 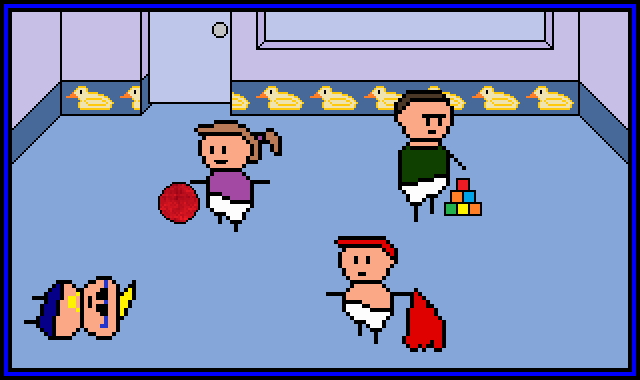 You are wearing your WICKED AWESOME DIAPER and hold your RED BLANKIE. In the room with you are three strangers that seem to be your age, which you like, because they're like you and you like that they are like you. The TALL TODDLER in green is playing with some BLOCKS. 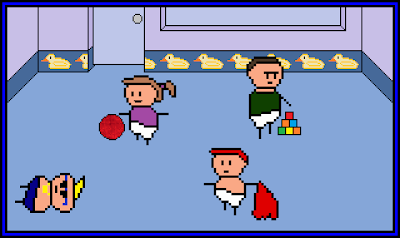 The GIRL TODDLER in pink is playing with a BALL. The FAT TODDLER in blue is wearing some SWEET BLING and SWEET SHADES and taking a NAPSIE. 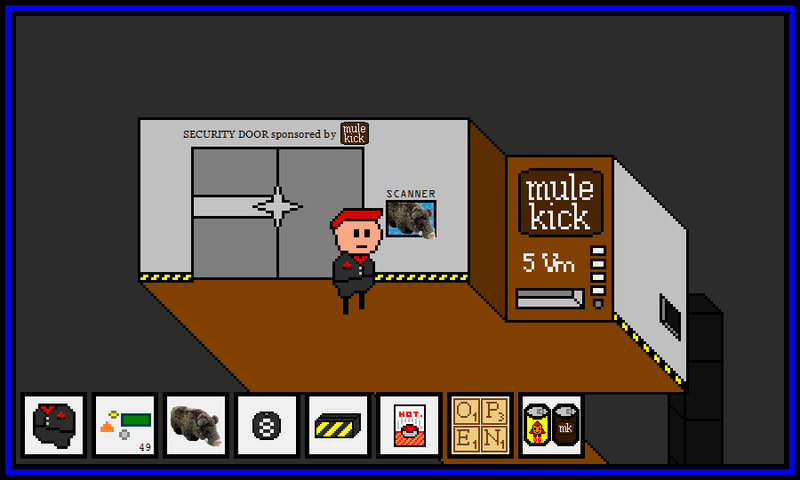 You place your HAND into the SECURITY SCANNER. It scans. SCANNER: Scanning. Object identified as... manus? Manus es malum prohibitum. Man, Latin? It's almost like there is no hope for you to get through this DOOR at this time. Maybe you can open the SECURITY DOOR with the sheer force of your STEELY SINEWS? You decide to drink a CAN OF MULE KICK and use the incredibly potent energy inside to enhance your door-kicking-down ability. Hmm. This soda is rated as moderately dangerous, eh? Well then. Let's Get Moderately Dangerous. You pop open the CAN OF MULE KICK and take a SIP. My gods... it's full of stars...! You feel the KICK and pass out. You can not yet handle this level of WICKED AWESOME SAUCE BEVERAGE. (62) This STUPID 8-BALL has been cluttering your inventory for too long now. You decide to give it one last shot. With a shake*, you ask the 8-BALL for guidance on your quest journey. The 8-BALL replies "Outlook Good." While reassuring, the 8-BALL's sycophantic overtures evaded the question. You persist and ask again. "Reply hazy," the 8-BALL says, "try again." Yeah. That's not going to happen. You toss the FREAKING 8-BALL down the VENT into the DARKNESS. It begins to glow as it falls. As it descends, you can almost hear it yelling back "Outlook not so good" and then "I shall return when you most need me, fear not, gentle master, for I shall guide you through the dark." The 8-BALL has been lost into the VENTING SYSTEM. Despite your dedicated listening, you do not hear it hit the BOTTOM. *Note: WICKED AWESOME ADVENTURES does NOT advocate the shaking of 8-BALLS. Doing so can seriously impede their use. SCANNER: Scanning. Object identified as Sus scrofa stuffica. Item not security cleared. SCANNER: Scanning. Object identified as oracular sphere. Item not security cleared. SCANNER: Scanning. Object identified as Shandor photon containment trap. Item not security cleared. SCANNER: Scanning. Object identified as oooooh, spicy. Item not security cleared. SCANNER: Scanning. Object identified as scrabblicular tiles (oak). Item not security cleared. SCANNER: Scanning. Object identified as a-beverage-if-you-can-even-call-it-that-because-it's-crap. Item not security cleared. Please incinerate. SCANNER: Scanning. Scanning. Scan--- Object identified as Mule Kick brand soft drink. Mule Kick: Ride the Mule, Feel the Kick. Do you sometimes wish for more energy during the day? Always tired when three o'clock rolls around? Grab a can of Mule Kick brand energy drink! It's the kick you need to get through the day! Warning: Mule Kick has been rated moderately dangerous, do not consume if pregnant, have a heart condition, are on fire, or have multiple applicable conditions; do not consume more than ten cans of delicious Mule Kick brand energy drink per day; Mule Kick corporation not responsible for death or dismemberment caused by use, ownership, or thoughts of Mule Kick brand energy drink. Item not security cleared but item delicious. Well. That didn't do much. You cram everything back into your WICKED AWESOME POCKETS. It doesn't appear that you can open this SECURITY DOOR at the present time. (60) Taking the most obvious course of action, you head down the SECRET PASSAGE revealed by the VENDING MACHINE. You are now in another SECRET ROOM styled like the one downladder. You can see a SECURITY DOOR (sponsored by MULE KICK ("Ride the Mule, Feel the Kick")), a SCANNER built into the wall, another MULE KICK VENDING MACHINE (which appears to be mounted firmly in place), and a small VENT which leads down into the DARKNESS. You can no longer hear the MUSIC. Outside the SECRET PASSAGE you hear a RUMBLING NOISE. 58 - Purchase ONE (1) of each SODA from VENDING MACHINES with VARIOUS MONIES. 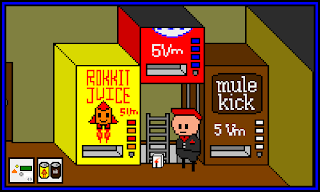 (58) You purchase ONE (1) CAN OF ROKKIT JUICE and ONE (1) CAN OF MULE KICK from the ROKKIT JUICE VENDING MACHINE and MULE KICK VENDING MACHINE (respectively), spending 10 VARIOUS MONIES to do so (49 left). That's funny. 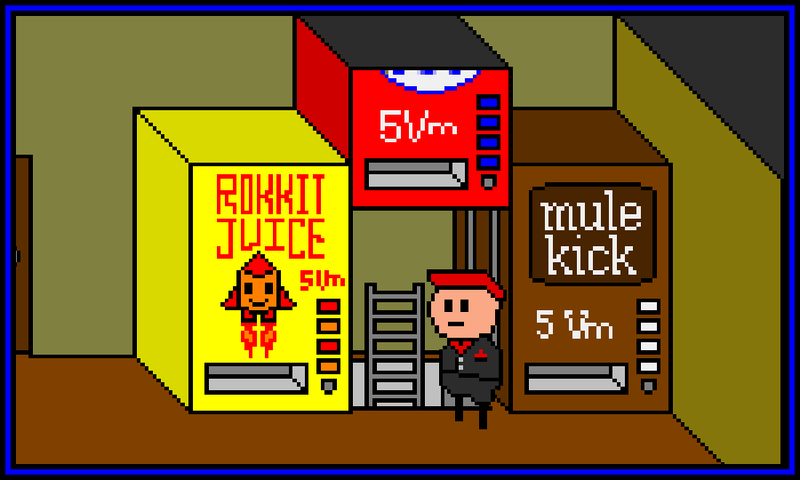 The MULE KICK VENDING MACHINE was out of three of its flavors, and the CAN you got looks... odd. Meh. In order to fit them into your WICKED AWESOME POCKETS, you put down your BOOK OF MATCHES. It was dead weight anyway, never did any right by you. You stash the CANS (which conveniently both fit in one POCKET). (59) Your anger toward the vast FACELESS CORPORATION that manufactures MULE KICK finally reaches a boiling point. You can't take it any more! With a leap, you execute a FUNDAMENTALLY SOUND ATTACK, kicking the everloving crap out of the MULE KICK VENDING MACHINE. The fundamentals, man. You gotta keep up with the fundamentals. In your haste, you somehow manage to knock your BOOK OF MATCHES down the HATCH. 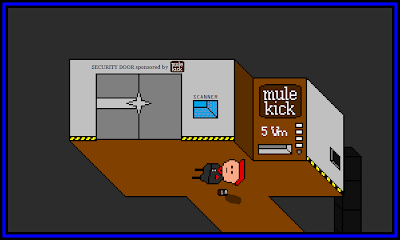 You land and fall against the wall. The SHEER POWER of your kick has triggered a HIDDEN MECHANISM, causing the MULE KICK VENDING MACHINE to retract into the side wall, and revealing a SECRET PASSAGE. And it's all thanks to the fundamentals, man. The fundamentals. The MUSIC from the WEST has changed to a new SONG. You check your--- OH. OH MY. You feel as though you haven't used a RESTROOM in a hundred and fifty years. Oh. You needed this. Oh. Oh, yes you did. 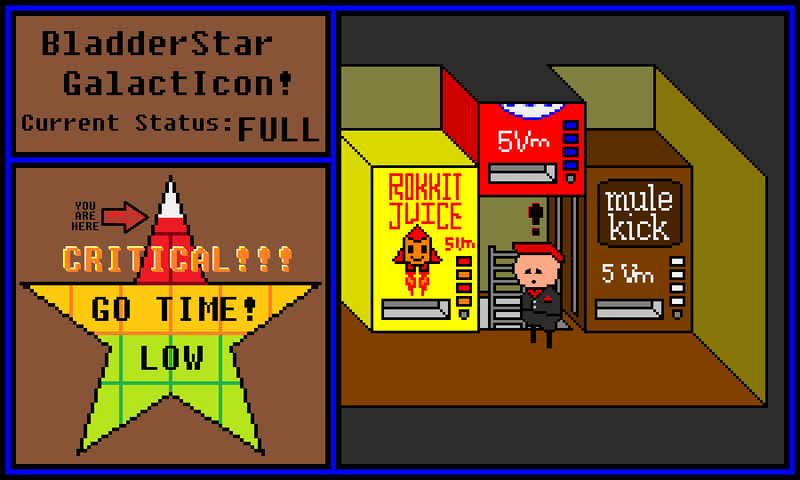 56 - Examine VENDING MACHINES. (56) Hmm. More VENDING MACHINES that you don't recognize. You examine each carefully. 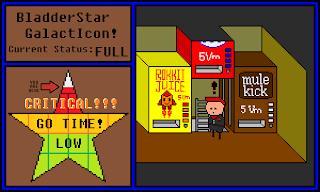 The yellow one is a ROKKIT JUICE VENDING MACHINE, bright yellow and featuring a mascot named DOCTOR EXPLODEY VON BRAUN. According to DR. 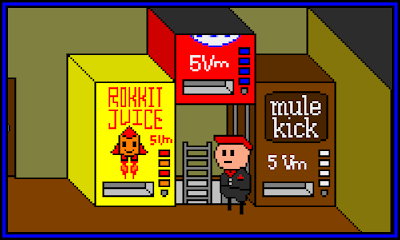 VON BRAUN's claims on the MACHINE, "ROKKIT JUICE is an EXPLOSION of FLAVOR that will LAUNCH you into the OUTER TASTEOSPHERE, after which you will be SICK BURNED by the BREATHTAKING ROKKIT REENTRY of AFTERTASTE which will BLAST with you through your MUCH IMPROVED day!" You are not sure, but this may be advertising-based hyperbole. The HEALTH NOTICE ranks this drink as MILDLY DANGEROUS. The brown one is a MULE KICK VENDING MACHINE. It seems to be a much more down-to-earth brand than the yellow one. 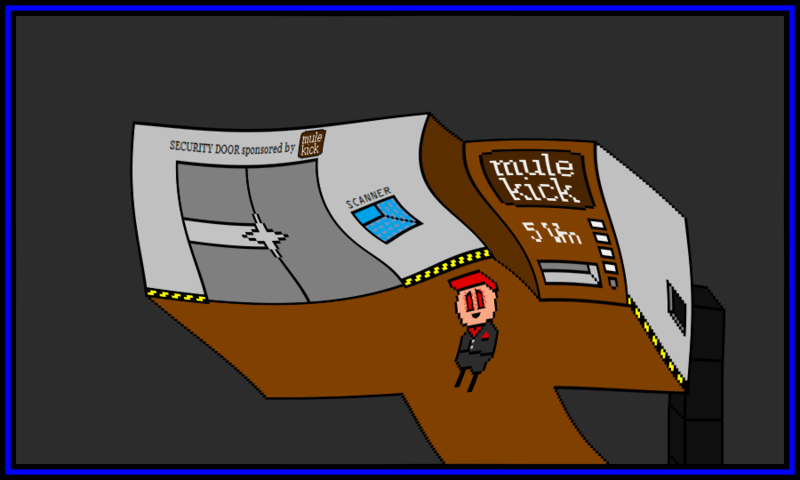 Its motto is also simpler: "Ride the Mule, Feel the Kick." According to the HEALTH NOTICE, this drink is ranked as MODERATELY DANGEROUS. 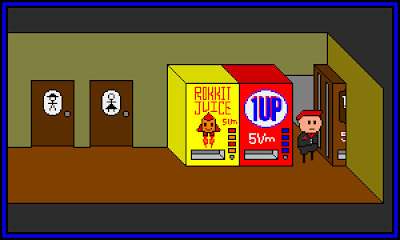 The red one is a ONE UP VENDING MACHINE, which also appears to have doubled as the hatch to your REFUGE. The top half of the MACHINE is hidden through a snugly fitted HOLE in the CEILING. This MACHINE is a bit different than the one you encountered earlier, but it is definitely the same brand. 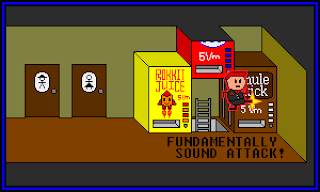 You can see the HEALTH NOTICE on this one; apparently, ONE UP is ranked as ANTITHETICALLY DANGEROUS, whatever that means. Each DRINK costs 5 VARIOUS MONIES to purchase. The ONE UP VENDING MACHINE is inoperable. You have climbed up and are in a VENDATORIUM of some sort. 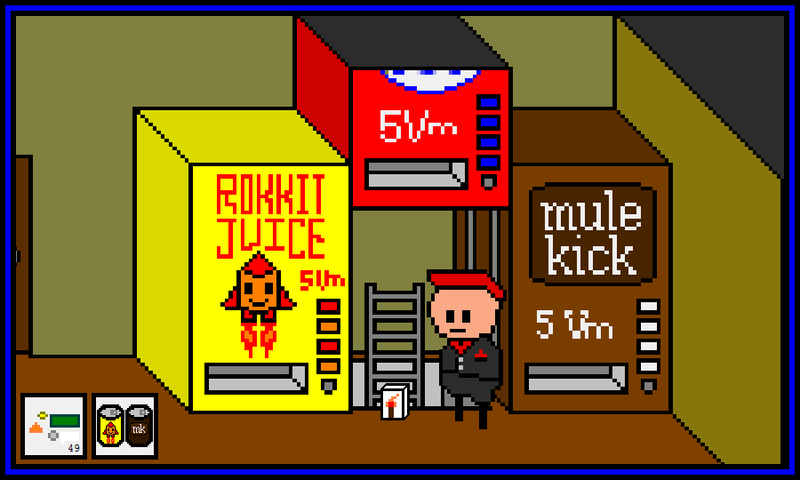 Beside you are three VENDING MACHINES, one for ROKKIT JUICE, one for MULE KICK, and one for ONE UP (which has been rendered inoperable following its ascension to allow your escape). The wall also holds two DOORS, which appear to be for a MENS' RESTROOM and a WOMANS' RESTROOM. To the WEST, you hear some kind of MUSIC. 53 - Dutifully inspect POWER INDICATOR. (53) The POWER INDICATOR indicates that the REFUGE's power level is very low, critical even. Probably low enough that any non-essential power drains would be dropped. 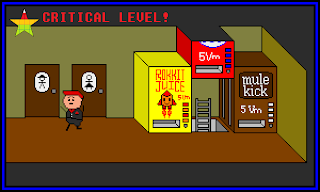 Of course, since apparently VENDING MACHINES and LIGHTS are considered critical... well, best not to think about it. You wipe some smudges off of the POWER INDICATOR with the WICKED AWESOME HANDKERCHIEF which is an integral accessory to your WICKED AWESOME SUIT and is held sacrosanct in a pocket not even counted among the SUIT's seven usable WICKED AWESOME POCKETS. 54 - MISS the MC. (54) With the MYOPIC CANDAEMON gone from your sight for at least a minute or so, you begin to feel the deep pangs of loss. Falling to your KNEES, you begin to wonder; Why did he go? Was it something you said? Was it something you did? Yes, actually. But you still miss him and OPE he has dental INSURANCE. 52 - Follow MC through DOORWAY, go WEST. (52) You head further WEST, following the MYOPIC CANDAEMON's path of egress. You are in a CORRIDOR which looks somewhat different than the previous CORRIDOR. On the wall is a sign for DARWINIAN INDUSTRIES, which appears to imply that you have been in REFUGE 3. Below this on the wall is a small POWER INDICATOR. 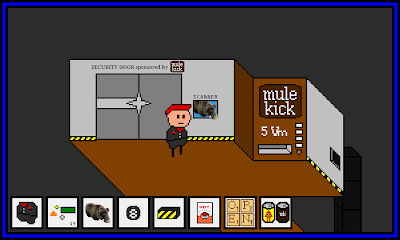 Around a small corner you can see a LADDER leading UP and a BUTTON labeled "Press to Open DO NOT PRESS!" You see no sign of the MYOPIC CANDAEMON. 51 - Go WEST, buy ONE UP with VARIOUS MONIES. (51) You head back into the CORRIDOR and check the VENDING MACHINE. You insert five VARIOUS MON--- wha? The VENDING MACHINE is out of ONE UP. Dang. You gather up your VARIOUS MONIES and move on, cursing the MACHINE and the TECHNICIAN or SALESMAN who has been lax with its UPKEEP and RESTOCKING. 50 - Go EAST, retrieve NON-MAGIC 8-BALL, TRAP, SAUCY LITERATURE and SMALL BOX. (50) You head back EAST to your ROOM. Making a wander of the ROOM, you pick up the POSSIBLY-MAGIC 8-BALL and the TRAP. You drop off the NOTE and PAMPHLET on the TABLE, since you've already read them and your inventory is getting pretty full. You head to the BED and pick up the SAUCY LITERATURE. Finally, deciding you don't need the BOX itself, you pick up the SCRABBLE TILES and put them in your last WICKED AWESOME POCKET. Your WICKED AWESOME POCKETS are full! 48 - Use TUSKS with TEDDY BOAR (48) Finally, the long nightmare is over. After braving the perils of a ROOM and a CORRIDOR, even defeating (kinda) a CANDAEMON, you have finally reached the APEX of your adventure. Combining the TUSKS and the TEDDY BOAR (NO TUSKS), you create the TEDDY BOAR (WITH TUSKS)! You now possess a fully armed and operational TEDDY BOAR. Of course, it's still just a stuffed animal, but, you know, it's cool, you guess. Kinda. You stick it back in your inventory. (47) Sensing that he is hungry, you offer the MYOPIC CANDAEMON the JAWBREAKERS that you found in your room earlier. YOU: Here, have these incredibly soft gumballs. In exchange for further delaying killing me, you get to sink your teeth firmly into these. Which are totally soft gumballs and not JAWBREAKERS. MYOPIC CANDAEMON takes the JAWBREAKERS and pops them into his mouth. He bites down hard. There are a pair of sharp, painful-sounding noises as MC bites into the JAWBREAKERS. His eyes grow wide. MC: My TUSKS! My beautiful TUSKS! They have been bwoken by your tweachery! The MYOPIC CANDAEMON spits out a pair of broken TUSKS and flees the room, leaving the DOOR wide open. MC: I need an EMERGENCY DENTAL OPEWATION! 45 - Examine GLASSES (45) You step in closer to examine MC's GLASSES. The lenses are very thick and the frames look pretty solid as well. The CANDAEMON's eyes look absolutely huge behind those glasses. Really huge. You may be... too close? MC: You are too close. You should probably be aware that you smell exceedingly edible. (46) You compliment the MYOPIC CANDAEMON's TUSKS, which he then reveals?--- OH MY! Those TUSKS are horrific! Maybe he should be called DENTAL NIGHTMARE CANDAEMON! ...there may have been something else you wanted to say or ask about the TUSKS, but dang... yeah, you probably don't want to mention those again. Ever. (42) You make up a ridiculous-sounding name and say that you are "PHILEMON RAPSKNUCKLE." The MYOPIC CANDAEMON chuckles and says you look nothing like the PRESIDENT, and you quite obviously do not possess PHILEMON RAPSKNUCKLE's PRESIDENTIAL MUSCULATURE. MC: Well, I'm still supposed to eat you after gutting you viciously. I might still do that.... Anyway, what is your name? (43) You place your hands on your hips and make a clever GUILE ATTACK against the MYOPIC CANDAEMON! You: (GUILE ATTACK!) I'm the pasty-skinned CANDAEMON. MC: (failure.) Hmm. That does not seem to be the case. With my GLASSES on, I can tell that you're a HUMAN. Besides, you totally just claimed you were the PRESIDENT. I... I just don't know if I'll ever be able to trust you again. To trust anyone... ever again. Your DECEPTINOMICON shows that your GUILE is too low! Blast, that was a pretty clever attack, too! The MYOPIC CANDAEMON repeats his directive re: killing you and once again asks your name. (44) You don't have any weapons equipped! To BOTHER the MC or his GLASSES whilst unarmed would be pointless! Additionally, while checking your inventory for weapons, the WIZARD HAT that still appeared there disappears in a puff of long-delayed CONTINUITY.